I had picked up a bunch of blood oranges last week to make this Boat House Punch, and had some left over. 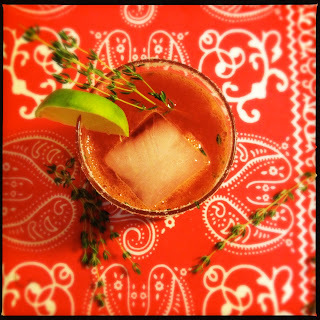 So when I saw this recipe from Aida Mollenkamp for a Blood Orange & Thyme Paloma, I just couldn't resist. Palomas are like a twist on margaritas, except there's grapefruit soda in place of the Cointreau. I took a slight departure from Aida's recipe, by combining fresh blood orange juice and club soda instead of using San Pellegrino's Blood Orange Soda. Either way is fine — I'm just a sucker for fresh juices. - In a small dish, combine the thyme and salt, using your fingers to crush and combine the mixture. - Run a lime wedge along the rim of the glass. - Dip the edge of the glass into the thyme and salt mixture. - Add ice, a pinch of the thyme salt, tequila, the lime and blood orange juices and club soda. - Stir and garnish with the lime wedge and thyme sprig.